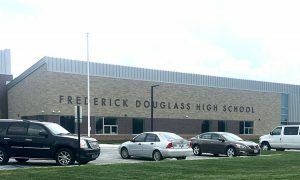 A student from Frederick Douglass High School was just awarded a Distinguished Leader award. Who was it from? Which student is it? 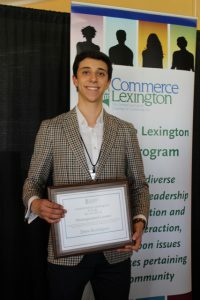 The Leadership Lexington Youth Program presented its 2019 Distinguished Leader Award to Drew Rodriguez, a junior at Frederick Douglass High School. He accepted the plaque April 10 during the LLYP graduation luncheon at the Clubhouse at The Red Mile. “It’s about servant leadership, and we have a responsibility to pay it forward. This group collectively not only inspires change, but creates change,” Drew said. The Distinguished Leader Award goes to a class member who demonstrates strong principles, dedication to community service, creativity, exceptional communication and interpersonal skills, and the potential to make a difference in the community. The selection criteria also include attendance record, participation, and willingness to reflect on all LLYP activities. Peers nominate candidates for the award, and the recipient receives a $1,000 scholarship upon high school graduation. The Class of 2019 included 48 juniors, mostly from Fayette County Public Schools.